The Denver Metro area has experienced more drastic weather changes this year than we have in many years. Please read on for current insect and disease information and tips to care for your trees and lawns throughout this hot period that we have been experiencing. Japanese Beetles have begun to fly! If you see any on your property, please call us as soon as possible. I would like to give you all an update on our Mountain High Helps Charity. For those of you that don’t know, we have partnered with the Children’s Diabetes Foundation (CDF) and agreed to match donations from $1 to $500. They have currently received $6,923 which we matched, and our employees have donated $2,000 for a grand total of $15,846 so far this year. Thank you all for making this such a success. If anyone would like more information on how you can help, please click on the Mountain High Helps logo to the right. From all of us at Mountain High Tree, we would like to wish you and your families a very safe and happy 4th of July weekend. It is only July, and 2016 has already been an interesting season. The cool and wet May has produced lots of foliar and vascular diseases. We have seen cedar-apple rust for the first time in a few years. Oak leaf blister has been evident all over the Denver Metro area. 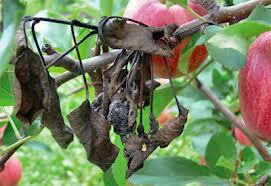 Fireblight in Apples, Crabapples, and Pears got started early, and is now making many of our wonderful ornamental trees rather unsightly. If that wasn’t enough, the abnormally high temperatures of June gave rise to massive insect populations of aphids, mites, leaf hoppers, and scale. We are now concerned that the ample moisture of April and May, combined with the high temps of June, will result in high populations of Japanese beetle showing up throughout July and August. We have already had our first reports of a few early Japanese beetle adults seen in Cherry Hills Village and Englewood. It will be important to use all our available tools to deal with Japanese beetles this season. Good monitoring will be vital to identify problem plants and areas. Soil treatments later in the summer will help to reduce the over-wintering population of grubs in the soil. These insects are difficult to control, and have massive appetites. Japanese beetles have a taste for so many plant species that landscapes can quickly be overtaken by a hungry population. There are a few things home owners can do and should know about their lawns as the heat of summer gets into high gear. The transition from cooler spring weather to hot summer weather has been a quick change over this year. This leads to extra stress on the lawn. Keeping blades sharp will allow the tips of the grass to heal more rapidly and prevent moisture loss and stress. A lawn cut with a dull blade will lose almost double the water as a yard cut with a very sharp blade.Mowing height adjustment is probably the most important practice to prepare lawns for hot weather. Mow at heights of at least 2½ to 3 inches. If in doubt, set the mower as high as it will go. Lawns maintained at higher levels usually develop deeper roots and dry out more slowly than closely mowed turf. Lawn growth will slow as the weather gets drier and hotter. Water lawns deeply, applying about 1 to 1½ inches per application, depending on site variables. Water early in the day or during the evening, but while the sun is still up if at all possible.Most lawns in our area consist of cool-season grasses such as Kentucky bluegrass, perennial rye grass, and fine fescue. These grasses naturally slow down their growing patterns as the temperatures head into the nineties. A yard that is not properly watered may go dormant in the heat of summer. If something happens such as a watering issue while on vacation and the lawn goes dormant, let it stay dormant until cooler weather returns. Do not allow lawns to turn brown and then water them back to a green condition over and over, as this depletes energy reserves and stresses the plants.Please note, a dormant yard during the summer is a prime target for insects and fungi. The more stress a yard is under the easier it is for pests to get established and do damage before anyone notices, since a dormant yard is already brown in appearance.Mountain High’s Lawn Department is always available to help with lawn care needs and we are strongly recommending Revive treatments as the drought situation continues. Eric was born in Cincinnati, Ohio where he began work in the landscape field. His 9 years of experience include working for a garden center, a tree company, commercial lawn maintenance, and residential/ commercial landscaping. He graduated from the Ohio State University with a Bachelor of Science in Landscape Architecture in August of 2016, and left Ohio in pursuit of a lifelong dream to move to Colorado. He had never been here before, but has found it is everything, and more, than what he had imagined. While in Colorado he has spent his winters sharpening his skills in the powder in hopes to one day take a trip to Alaska, and drop in from a helicopter. He says, “I had never dreamed Colorado could get any better, and then the mountains turned green.” He spends every weekend exploring the wilderness far and near. His favorite hobbies include fabrication, photography, and music. He has an interest in all genres, and says he especially enjoyed the CO Symphony’s performance of David Bowie. He says he has found the perfect career for him at Mountain High. He really enjoys having the chance to meet different people, study the native plants, and to paint a living aesthetic with the available palette. What really draws Eric to this career path is the opportunity to still get his hands dirty sweating out the summer sun in beautiful Colorado. It is important to make your irrigation efforts as efficient as possible. Water that runs off the surface and into the drains and street has no benefit to your landscape. It can be helpful to implement “interval irrigation” to improve the results of your watering. Interval irrigation uses shorter irrigation system run times and more frequent cycles to improve soil saturation. For example, if you have a 15 run time, you can turn that into two cycles running nearly back to back of 8 and 7 minutes respectively. This allows the soil to absorb the water, and with the 2nd cycle it can penetrate deeper into the soil. This will decrease the amount of water that runs off the soil surface. The crew were wonderful. They did a great job and were pleasant, cheerful and hard workers. The trees look better than I expected. “Consistently does a fine job on our trees! On time, professional, very genuine and honest. Everyone was friendly, professional and didn’t try to sell unneeded services. Quality service and exceptional value – I highly recommend this company! The men who trimmed the tree did a fantastic job. The guy in the bucket was awesome! The crew showed outstanding technical skills. Top-notch work on a very complex job. Wess was very knowledgeable and spent time explaining all he was doing. Very professional, prompt, knowledgeable and kind. Everything is looking good in the Springs and we are busier than ever. There are no new issues to report, so we thought we would give you a list of things to do this weekend. Our best to all of you and your families for a safe and happy 4th of July weekend. The biggest show in town will be the Colorado Springs Philharmonic Fabulous Fourth summer concert at Memorial Park. This free event is fun for the entire family. When: July 4, 2016. Food vendors available for various costs. It’s time to fly with Adventures Out West’s 5th Annual 4th of July Flag Flying Festival! Start your 4th of July with a little adventure and a lot of patriotism. Show your American pride by flying the Red, White, and Blue. Must supply your own flag (max size 5’x7′). Souvenir T-Shirt. Zips start at 8:30 am and 10:30 am – course is open 2 hours per session. The Manitou Springs Volunteer Fire Department is proud to display the Fourth of July Fireworks again this year. Get one of the best seats in the house in Downtown Manitou Springs, and enjoy the magnificent views. Fireworks will be shot off from Higginbotham Flats. If you have any pruning, removal, plant health or lawn care needs and would like a free estimate, please click the link below. Your local experts are here for you!